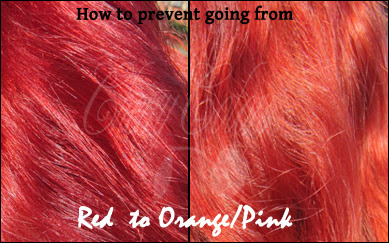 How to keep your red hair red? - Cherry Colors - Cosmetics Heaven! How to keep your red hair red? When I first dyed my hair red, I didn't do much to keep it from fading. The fading was also really subtle, so I didn't notice it until the red was completely gone (I had it dyed over dark brown hair color). So when I bleached my hair and dyed it red, I really didn't think much about it. But after 2 weeks, my hair has gone from bright red to orange and in some parts pink, I really had to do something about it! I was already using a gentle shampoo + conditioner (K-Pack line) but after every shower my bath tub looked like someone was murdered in it and my hair got lighter and lighter. That's why I applied some drastic changes, and now after one month, my hair is again super bright red without having to re-dye it! :) Although I had to dye my roots, they just looked plain wrong against my bright red hair. Ugly! Use a gentle shampoo, best for red hair or colored hair, use mild water not warm! Condition your hair and wash it with COLD water. This part it tricky, plus it's a terrible experience but it gives your hair some extra shine and locks the color in. Do you have any other tips for keeping the red hair red?